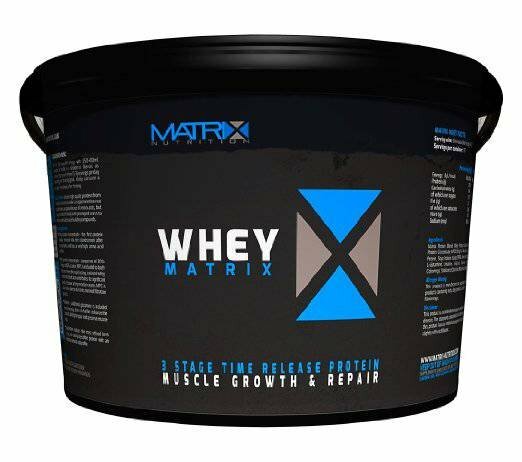 Whey Matrix Protein Ingredients: Matrix Protein Blend - Whey Protein Concentrate WPC80, Milk Protein Blend (Milk Protein Concentrate MPC85 - high in Micellar Casein, Whole Milk Protein). Soya Protein Isolate SPI90. Amino Acid Matrix (L-Leucine, L-Glutamine, Creatine, L-Glycine, Taurine). Flavouring, Natural Colourings, Stabilisers (Citric Acid, Malic Acid), Sweetener: Sucralose. Matrix Whey utilises high quality proteins from multiple sources to create a supplement that not only delivers a rapid release of amino acids, but also provides the body with prolonged access to these essential muscle building compounds. Matrix Whey isn't a product that has ignored carbohydrates either; we have included 16g of fast acting high-GI carbs in order to further facilitate muscle recovery and development post exercise. Key Ingredients: Whey protein concentrate - the first protein rapidly released into the bloodstream after consumption and has a very large amino acid profile. Milk protein concentrate - comprised of 20% whey and 80% casein, MPC is included to both follow on from the rapid acting, isolated whey protein concentrate, but also contribute its significant levels of slower acting micellar casein. MPC is also nutrient dense due to its minimal filtration process. Glutamine - 4.3g of glutamine is added per serving, this is to further enhance the products ability to repair and preserve muscle mass. Soya Protein Isolate - the most refined form of soy, an easily digestible protein with an extensive amino acid profile. Who is Matrix Whey ideal for? Matrix Whey is a flexible product which is ideally suited for those looking for a cost-effective supplement to use in conjunction with a training programme aimed at increasing weight and muscle mass. We've got numerous products in our range stripped bare of carbohydrates but this isn't one of them, we understand not everyone wants a supplement comprised completely of protein and nothing else, and not everyone wants a mega calorie mass gainer, this is where Matrix Whey comes in. It's a product ideal for those looking for steady weight gain, or it could be used in conjunction with a weight gainer when trying to hit a precise protein/carbohydrate daily intake.